First of all Happy New Year... Yes, we've been busy, distracted, and just all around getting things in order for what's looking like a great year for the brewery. Where to start... The owners at FiftyFifty have enlisted a renowned Sushi Chef and have started the soon to open 'Drunken Monkey' Sushi, tapas and sake. I've seen the menu and it looks great, and the space is looking really good too. We'll be serving some FiftyFifty brews there as well as Japanese beers and course several sakes. 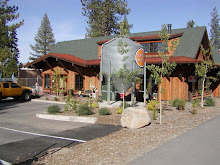 The Drunken Monkey is located in the Rock just a few steps from the brewery. Brewery wise there are many things in the works. The 2008 Imperial Eclispe Stout has already sold out of it's first bottling. There's more of course and we will be announcing the release date of the remainder of the bottles soon. We'll have the 2007 and 2008 version on tap as well...keep an eye on this space. So far this year we've brewed a new Abbey Dubbel which promises to be a welcome return to the tap line up. The Abbey should be on tap by the end of January. We also made our first foray into brewing 'Double' IPA. We've been kicking around names for this beer and nothing is set yet but it will be 'uber' hoppy. Kyle and I had a heck of a time brewing this one as the amount of hop material in the kettle was making for some anxious moments when we were transferring from kettle to fermenter. Long story short the beer is happily fermenting and we're looking for this to be ready in the first week of February. Our new beer storage cooler is here and that means we're getting closer to distributing. Our draft Manifesto Pale Ale will soon be in select better beer locations. I'll be sure to keep that information updated here. Lastly, our 'bottling machine' is in transit and that means before long we'll have a few of our brands available in 22oz bottles. They will be for sale at the brewery and in the future at select retail outlets. To close I just wanted to thank all of our friends and guests of the brewery. 2008 was a great year for the brewery and we couldn't do it without you guys! Our beer outlook is good for 2009 and I have a feeling the Imperial Eclipse Stout is going to bring us a lot of attention as the 2008 vintage is stellar and we are getting asked for it from folks across the country. Pretty amazing stuff!